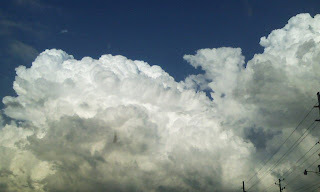 We had rainy, stormy weather blow through Saturday which made for some awesome clouds! VolleyGirl and I went to Walgreen's to purchase a birthday card and all I wanted to do was look at the clouds and take photos. Sadly, we were in a bit of a hurry. My head was spinning from looking in all the directions at the different shades and shapes. These are only the tip of the 'cloudberg'! I took these with my cellphone. There are a few more on my cellphone but for some reason this morning they are failing to send to my email....argh! 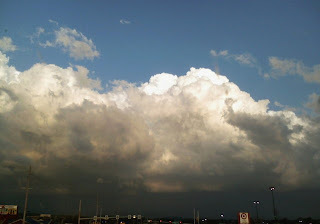 My family is accustom to my constant sky/cloud photos but gives me a hard time about it.......doesn't deter me however! Have household duties today and tomorrow but hopefully I can fit it some drawing later.......have a great Monday! Beautiful pictures! I wish that you would join our "Friday Shoot-Out's". We have a growing larger every week group that takes pictures of a given subject matter every week and post them on Friday's. Last week was cemetaries....this week animals....any kind of wildlife that you see. You take such nice snapshots, won't you join us? We have folks from Brazil, China, Germany and all over the U.S. in our group already. 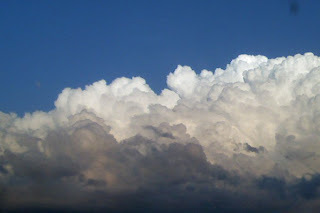 Beautiful cloud picture. I think I love the first one best but they all are great. Looks like the storm circled you. I am the same way when I see clouds, I think the most pictures I have in one place are my sunset/sunrises and cloud pics... forget the kids. LOL... they always say to me, HEY, take a picture of ME! And my camera is always pointed toward the sky. :) Have a great Monday too! And Sky Watch isn't until Friday! Sounds like you have plenty more though. yes and i wish you would join our skywatch group too, these are fabulous. 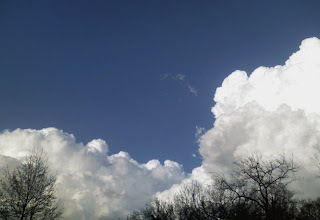 These are wonderful big, puffy clouds. I love watching the everchanging sky, too. No wonder your head was in the clouds. These are gorgeous. The picture with the dark city under it is just great! 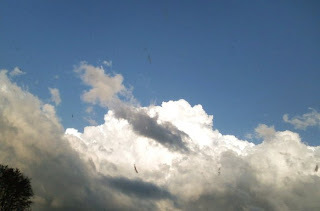 The clouds are just wonderful so are your shots! I was reminded of my college days when i used to do a lot of sky-watching...infact I used to spend 15 minutes or more everyday skywatching at the different hues of the evening sky(especially).These days it's now and then...but every night before i go to bed I look at the sky to get a glimpse of a star or the moon or atleast the dark and hazy clouds. LOL I took some of the same pictures the other day too. 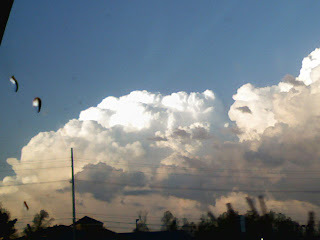 Those clouds were AMAZING!!!!! The whites in them just glowed!